It turned out that the Signal crayfish (Pacifastacus leniusculus) wasn’t quite as calm and dormant as the experts had expected; instead it when on a bit of a rampage, escaping any enclosures and entering the nearest bodies of water (they’re actually pretty fast when on land too). 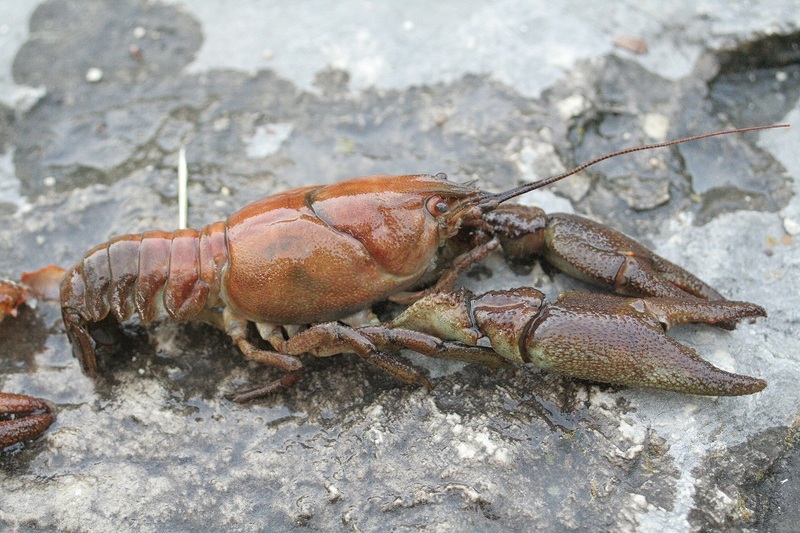 This turned into a bit of an ecological nightmare as there was already a native crayfish in the UK waters, namely the White-clawed crayfish (Austropotamobius pallipes). 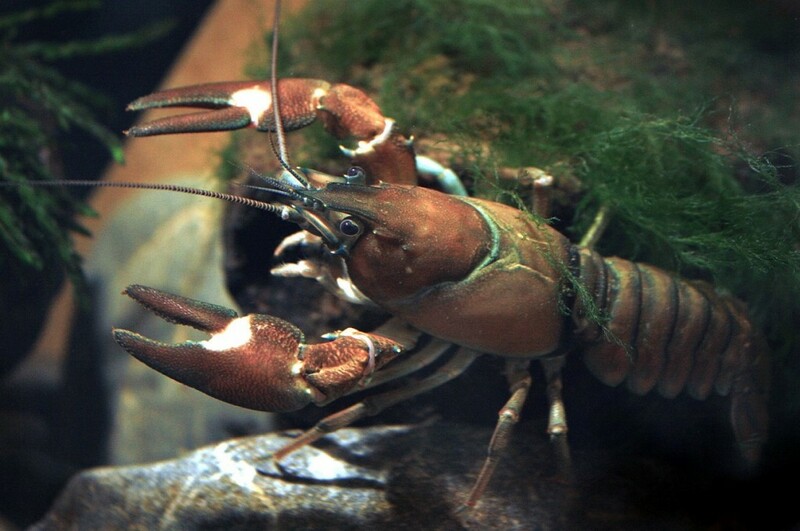 This native crayfish is a much smaller and less aggressive type of crustacean, whereas the non-native Signal is relatively large, fast growing and aggressive. It also loves to burrow into our river-beds, making a little nest for itself whilst really devastating the riverbank. This also leads to the silting-up of the river bed, and can really affect the ecology of the waterways. If all of that wasn’t bad enough, the non-native Signal crayfish also carries the crayfish plague, which of course the native crayfish has no resistance to. Now if all that background story wasn’t enough motivation for you, it turns out that the Signal crayfish is actually very delicious to eat (who’d have guessed it?!) and that by repeated and extensive trapping of them in areas where they’re prolific, their numbers can be reduced. Many experts believe it’s already too late, and that the tables have turned too far in their favour (our native white-clawed Crayfish is now only found in the Midlands and further North) but we shouldn’t give up on them just yet! Disclaimers and Warnings – Think before you Trap! There are a few very important points worth knowing before you decide to go out trapping crayfish. First of all, you’ll need a license from the Environmental Agency. Second, you need to ensure you’re using the correct gear – traps can and will catch other wildlife, with otters being one other likely catch. These are of course highly-protected and so you can get in a lot of trouble if you are to accidentally catch any. You also have to be extremely careful not to catch the native white-clawed crayfish, and this is only possible by laying traps in areas of water where the native crayfish isn’t resident. So some background research will need to be carried out before you go crayfish catching. A few years ago the Daily Mail reported that somebody was caught catching (and later eating) the native, White-clawed crayfish, by mistake. They were ordered to pay a fine of £4,000 by the court – don’t let that be you! It’s also really important to only trap in non-native crayfish waters, and to clean your trapping equipment after use, due to the risk of transferring the deadly crayfish plague from one area of water to another. Some people simply lay their trapping gear in the sun once they’re finished, as this allows the heat to kill off any fungal bacteria present on the equipment. In order to go out and legally catch Signal Crayfish, you’ll need to apply for a license from the Environmental Agency. You can do so, and find out a lot more information about the process, from this page and you can download the license application form here. Thankfully it’s completely free to apply for a license to trap Crayfish. This is where it can get a bit tricky for some people. As part of the license application process, you will need to give details of exactly where you will be trapping. This is because some areas aren’t suitable – either because there are native crayfish present, or there are otters present, or some other reason (Site of Special Scientific Interest (SSSI) for example). 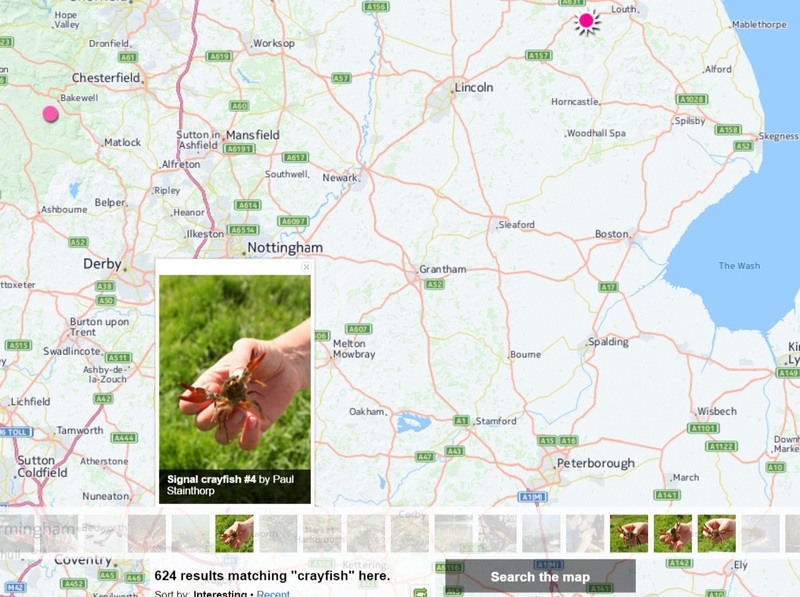 The problem is, how do you find out where you can find the Signal Crayfish in your local area? This is something we’ll take a look at a bit later on. You will have to have the landowners permission before you put down any traps. This can also put some people off, but if you’ve been lucky enough to find a location where the crayfish are present then why not ask the landowner – maybe you can offer them a few delicious crayfish as a reward later on. 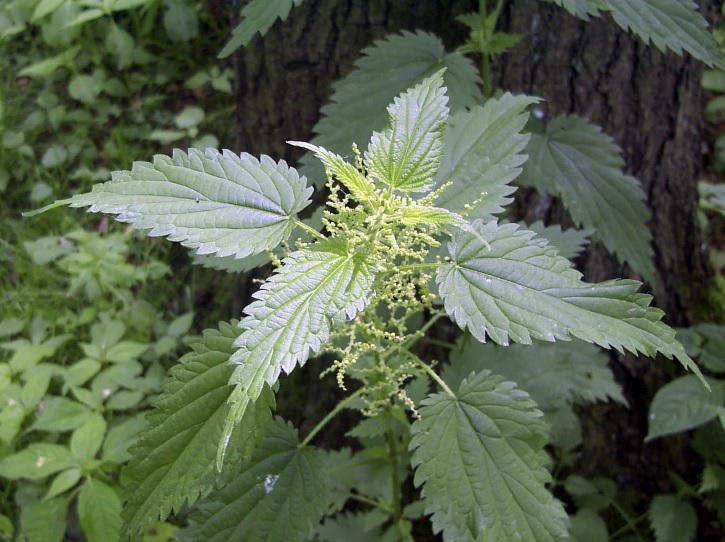 This permission is needed as part of the regulations set out by the Environmental Agency. They must also have the EA identity tags attached. Where can I find Signal Crayfish near me? As mentioned earlier, you need to know the location you’ll be trapping Crayfish when making the application to the Environment Agency. But how do you find these creatures – they’re meant to be prolific, yet it can be tricky pinning them down to a specific spot, and a lot of it will rely on local information. The Signal crayfish were originally introduced in Southern England, and this is why the southern counties are so worse-hit by the influx of non-natives. It may also be because it’s a bit cold for them up North, or they just prefer the warmer Southern weather (who can blame them). That being said, they have been reported in Scotland, and even on the Isle of Man, but Crayfish haven’t yet been found in Ireland. 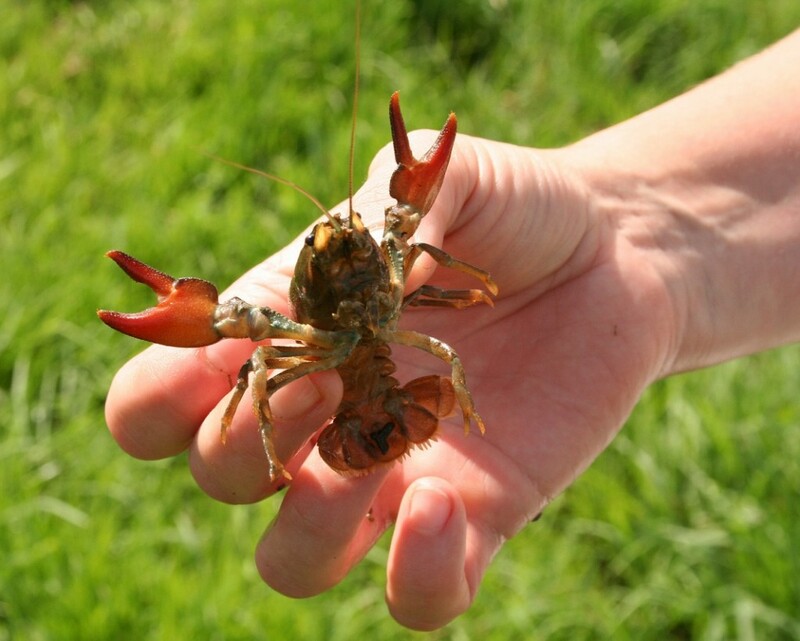 Our advice on finding Signal crayfish near you is to befriend some local fisherman. Try heading down to your nearby rivers, where fisherman are present, as they obviously spend many hours by the riverbank and will have seen all-sorts. To them, the crayfish are a pain because they eat and scare away fish, and will also have a go at the bait on their line. The next step would be to try your nearby fishing lakes. This is where the crayfish can cause huge problems – this is a bit more of a “commercial” venue, so anything like crayfish will really do damage to their trade. Try speaking to any of the people running the lakes, and any fisherman, to see if they’ve noticed any. Crayfish are pretty greedy and so there’s a lot of food in these lakes – either from the well-stocked lakes, or the copious amounts (and varieties) of baits used by fishermen. Local wildlife agencies and branches of your Environment Agency may also be willing to help you out on your quest if you’ve not struck crayfish-gold just yet. If you haven’t already you may also want to check on the internet for any references – from local fishing forums or even on social media. One quite unknown source of finding their approximate location is by using photo-sharing site Flickr – just search for Signal Crayfish, and then select a few relevant images. 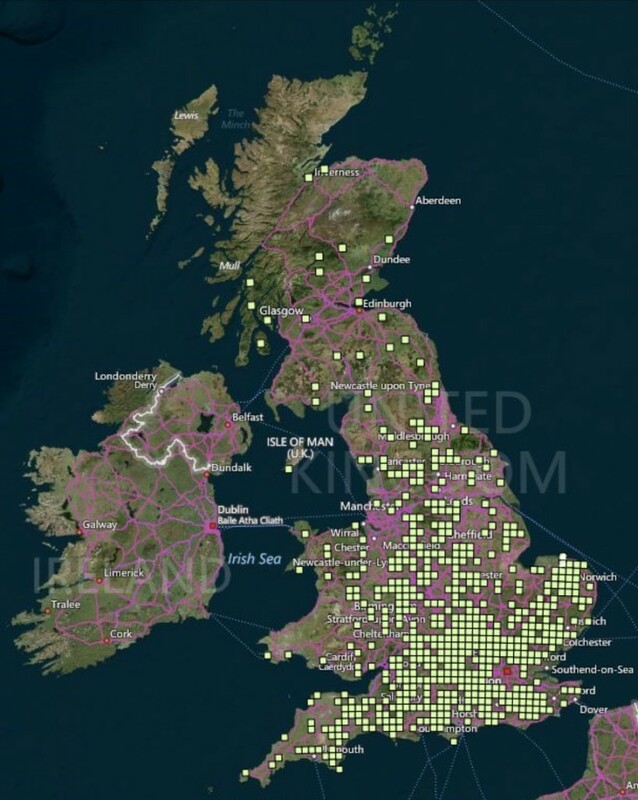 If you look below the post you will often find a small map displaying the location the photo was taken, as well as the date (unless the photographer has opted out of sharing this data). Now finally, down to the nitty-gritty – how to catch these elusive Signal Crayfish. There are a few techniques to catching them – some people like to chuck-in a line with a piece of bacon wrapped around it, an old fish-head, or even some catfood (just puncture a tin several times to let the aroma escape). Smell is important to crayfish so anything like the above would work well, and this can be a nice “tester” to see if any are present – and it’s also great fun too (just like crabbing by the seaside!). Another way to detect their presence is by looking for small holes in the riverbank – this is where they’ve been nesting, and so should be a good location to try. After establishing they’re presence you’ll want to bring out the big toys – here’s where you can use a collapsible trap, perhaps one which you’ve ordered online, or you can also try making your own (just be sure its the correct size, based on the dimensions mentioned earlier). You should place the baited trap (fish-head, catfood) into the water, and tie it to the nearby riverbank to stop it floating away and doing some lasting damage to other wildlife. Make a note of the time you placed it and come back in 24 hours time – this is really important as you can then release any other bycatch, if you were unlucky enough to catch any. When returning the next day, you should bring with you some kind of holding-cage to allow you to keep any that you’ve caught. 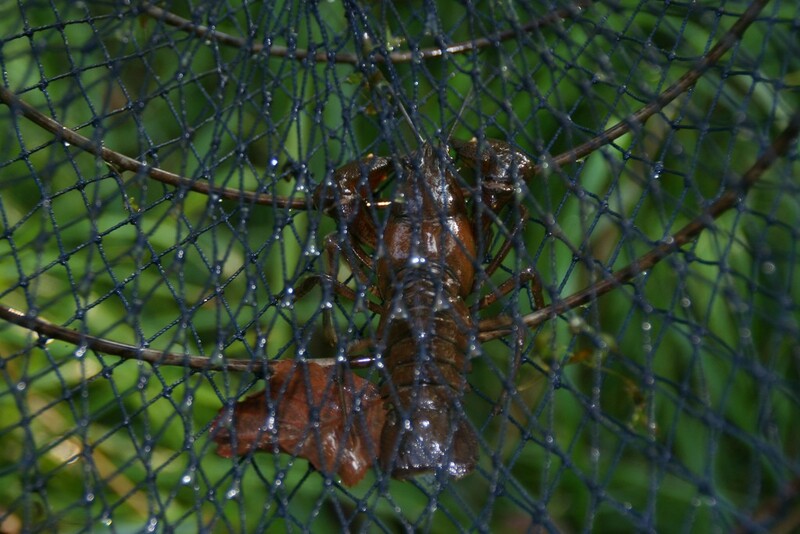 Pull gently on the ropes to bring the trap in close (some of the Crayfish can be holding on from the outside, trying to get at the food) and then empty over your holding cage/basket. It’s worth noting at this stage that it’s illegal to return any non-native Crayfish once you’ve caught them. You should also try to correctly identify them in case any of them are the native white-clawed crayfish, in which case those will need to be returned. If you want to check out some other trapping techniques, The Guardian did an article several years ago about trapping Crayfish, in which they used an old bike wheel as a drop-net. 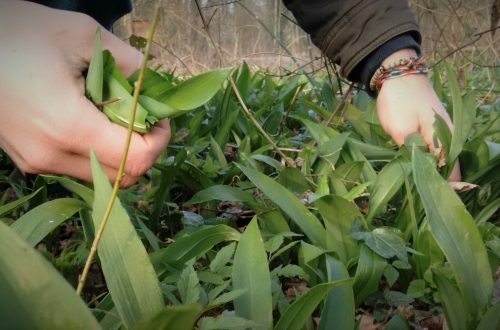 There’s also an excellent guide to trapping from the guys at ForageSussex – I really recommend taking a look at both of those, especially the latter.  I’ve also included a video below from the foraging-legend that is Ray Mears, where in one of his programmes he captures and then cooks the Signal Crayfish – if you weren’t already convinced about giving them a try! The Signal crayfish is delicious and not too far from the taste of lobster. If you do want to ensure you have the best possible culinary experience, we really recommend leaving the crayfish to “purge” for 24 hours before being consumed. As you can imagine, when they spend their lives in the river-bed feeding on all sorts they can accumulate some dirt and grit, so leaving them in a bucket of clean water for a period of time should allow them time to expel any waste products. That’s not to say they wouldn’t still be delicious fresh from the river! Incidentally, if you’re going to be keeping your crayfish for longer than 24 hours you’ll probably need to apply for a special license from the Environmental Agency, separate from your standard license to trap. This depends on where you’re located in the UK though, and when we enquired about this they stated that because of our location (Dorset), the native crayfish was so well established that it wouldn’t matter if they were to escape if we held them, so the extra license wasn’t a requirement. As with many other crustaceans, the RSPCA recommends that before killing your catch you leave the crayfish in the freezer for about an hour to render them unconscious. This makes their dispatch, when plunged into rapidly boiling water, much less painful. They may be a nuisance to the UK wildlife and water-habitats but that doesn’t mean you shouldn’t respect your catch and give them the most painless end to their life as possible. Our favourite way of preparing crayfish is simply to place them into boiling water for about 5 minutes, until bright red, and then serve immediately – well, when cool enough to handle! Crack them open on the table and serve with a home-made garlic-mayonnaise dip, alongside some chunky home-made chips.